On May 15th and 16th five runs were performed to validate the detection of a coordinated attack on national level. 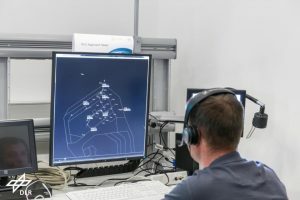 Three GAMMA security prototypes acted in the geo-distributed simulation: The ISS (Information Security System) in Florence (premises of Leonardo), the SMP (Security Management Platform) in Chieti (at Leonardo premises) and SACom (Secure ATC Communication) in Braunschweig (at the German Aerospace Center, DLR premises). 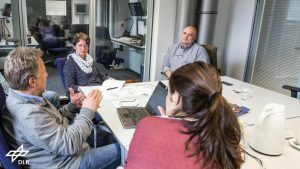 The trials were executed as human-in-the-loop simulations supported by 6 test persons: four ATCOs in Braunschweig and two Leonardo colleagues in Chieti. Figure 1: Air Traffic Controller acting as SACom test person. 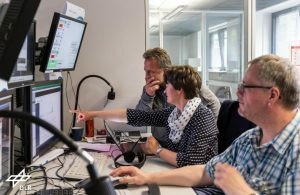 Figure 2: Inspecting live SMP picture at exercise supervisor working position in Braunschweig. Figure 3: Debriefing after a run including explanation of the performed security incident.